65 Specialized High School Math practice & Workbook - Increase your Score! 65 Specialized High School Admissions Test Math Practice and Workbook! Need to brush up on your SHSAT math? Everything you need! Free practice questions, test information, practice tests, math workbook and more! The SHSAT mathematics section has 50 questions. Below is a detailed list of the mathematics topics likely to appear on the SHSAT. 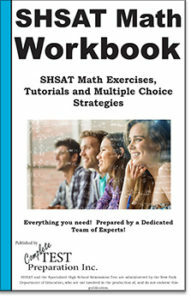 SHSAT Math Exercises, tutorials, tips and tricks, multiple choice strategies and more! Practice your SHSAT Math! Exercises, tutorials, tips and tricks, multiple choice strategies and more!